The most important physical property of a lubricating oil is viscosity. 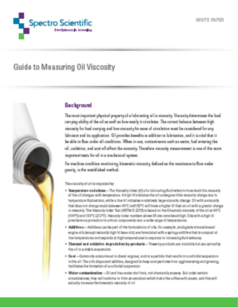 Viscosity determines the load carrying ability of the oil as well as how easily it circulates. The correct balance between high viscosity for load carrying and low viscosity for ease of circulation must be considered for any lubricant and its application. Oil provides benefits in addition to lubrication, and it is vital that it be able to flow under all conditions. When in use, contaminants such as water, fuel entering the oil, oxidation, and soot all affect the viscosity. Therefore viscosity measurement is one of the more important tests for oil in a mechanical system. gravity, is the established method.